Last Friday was a ridiculous day for me, and I had planned to make this post about how a car dealership that was caught up in its ridiculousness lost sight of their goal and failed to sell me a car. But I’d like to have a wider discussion. 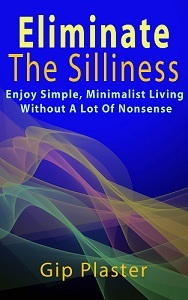 No matter how simple your life is becoming, you must sometimes cross into other people’s silliness to do business. What are some of the ridiculously silly systems into which your life must sometimes dip? If I had written this post as I originally intended, it would have been called “The Ridiculousness of Car Buyer: Why I Actually Felt Sorry For One Car Salesman”. Here’s what I was doing last Friday while you were (I hope) reading my post about preserving your simple legacy. We decided we could benefit from lower car payments and better fuel economy by trading our Toyota Camry for one of the smallest and most economical cars on the market, the Toyota Yaris. Since the dealer nearest us didn’t have the five-door model in stock, we went to Toyota of Fort Worth. The salesman was new, so thankfully he hadn’t yet established the usual banter and smarmy attitude common at car dealers around here. We looked at the car on Wednesday, test drove it Thursday evening and decided to return Friday after lunch to buy it. We completed the application, had our Camry evaluated for trade-in and waited for the first offer. Since we had researched prices online and used kbb.com to evaluate our trade, we didn’t expect any surprises. We could easily save $70 a month on payments — plus lots of gas — by trading. And we liked the fun little Yaris. It all made sense. But the first number they presented to us shorted at least a few hundred dollars on the trade and inflated the price of the car more than a thousand dollars. The calculation of the monthly payment also didn’t add up. We sent the salesman back to bring the offer in line with the reality. Here’s where the ridiculousness begins. The salesman brought back a finance guy who started to show us the so-called “dealer invoice” — a mostly fabricated document some dealers use to defend a certain price. I’m not interested, I said, just tell me what you’ve come up with for the monthly payments. No offer. The first offer was final. There’s no room for adjustment. Not a penny. What? Was this one of those no-haggle dealerships? Even no-haggle dealers usually build in a five percent haggle margin. But this couldn’t be one of those because we had just heard a heated negotiation between another salesman and someone wanting a $32,000 car for $500 a month. They made many counteroffers trying to accommodate him. So what was going wrong with our transaction? We stood up to leave since there was an insurmountable $3,000 between the reality of my research and what they wanted for the car, but I was commanded to sit back down. I was certainly less than pleasant with the finance guy, but he made a silly mistake. He became offended and lost sight of his goal: to sell a car. I called this business professional an “idiot”. I don’t say that with pride, but I honestly accept my simple action. I said what I saw. Still, offended as he now was, he left to get a final offer, but came back with no new offer. They missed their mark, going from silliness into ridiculousness. They are in the car selling business, and they let two guys who wanted a cute little car leave in the one we drove in. Of course, we immediately called Toyota’s toll-free number to file a formal complaint against the dealer. In a few days, I’m sure we’ll get an apology, but I was never offended and I’m not even mad anymore, so how will that help? I felt sorry for the salesman, incidentally, because he seemed to do everything right, but he lost his commission because of his colleagues. To shorten a long story, we’ll just keep the Camry, thank you very much. I’m not willing to set foot in any car dealership anytime soon. Surely, a car dealership must be the exact opposite in every way of the simple, deliberate life I want. But having a car isn’t optional in this part of Texas, and since our house is worth less than we owe on it, moving isn’t very feasible either — and that’s a long story for another post. Whether we like it or not, we must participate in ridiculous systems. But we can limit our interactions with them. Since I don’t know a good car dealer, plumber or mowing service, however, I’m likely to involve myself in silliness — and perhaps ridiculousness — when I try to do business with one I choose randomly. How do you deal with life’s ridiculous systems? Can you manage to fit into nonsensical systems well enough to do your business to your benefit? I felt sorry for the car salesman because he’s a real person who was cheated by nonsense. Soon, I suppose, he’ll either move on or become part of the ridiculousness. Reminds me of something I like to say sometimes. Very silly indeed! People (dealerships) get caught up in asserting dominance over a situation and forget why they’re there in the first place! The customer is always right for a reason, without us their jobs wouldn’t exist. Exactly. And they lost sight of their goal. Customers are ultimately always in charge. While this nonsense wasted my time, theirs was wasted too. This is why I’d rather not buy anything at all. I could tell you the story of my shopping trip to Walmart last night. With most of the meat in the store rotten and most of the vegetables sold out, I’m not sure why they were still open. I could tell that story, but I won’t. If you don’t mind me pointing this out… in negotiations, there is usually one side who needs the deal and one that does not. The side that needs the deal makes the concessions, while the side that does not gets to name the terms. In this deal, you were the side in need. You didn’t go in there curious about a new car, you went in there with a specific need for a specific model at a specific price point. This was all about you and your budget, and it was never about the salesman. No one in that building had any incentive to cave, because this was your need, not theirs. Randy, I have to disagree. Gip didn’t need anything (evidenced by the fact that he’s keeping his Camry). He didn’t catch the bus to the dealer because his car had broken down. He didn’t drive in in a car that was falling apart. He’d done all the relevant online research, and based on what he’d found he had what he believed to be a reasonable expectation of price, payments, etc. At the point when the dealership gave him pricing that was substantially higher, and a monthly payment that wasn’t in line with the equation above, they removed his motivation to buy. Since the whole focus of sales is to determine the customer’s buying motives (and use them to make the sale), the dealership screwed up – assuming the numbers Gip got off the Internet were anything close to accurate. There’s no other way to look at it. Had they played their part right Gip would’ve had a new car (and been happy – resulting in positive word of mouth, in theory). The dealership would’ve made money (which is a need that they have). The salesperson would’ve made some sort of a commission (which is a need that he has). As it is, the dealership has no money, the salesperson has no commission, Gip has no new car, and Gip has a believable story about how schmucky the dealership was. They have tons of courses and seminars and books and lessons on sales. Those people understand human psychology, and they prey on it. Bottom line: if gyp didn’t like the offer they made, he should have left. When you have the upper hand, that’s what you do — you walk away from a deal you don’t like. But Gip merely “stood up as if to leave.” It was an act, and they called his bluff. If he’d done his research and settled on the only price he was willing to pay, he should have laid that out from the start, and when it was declined, he should have walked away and brought the offer to someone new. Good salespeople are experts at human psychology – but many salespeople aren’t very good. Randy, Gip said “We stood up to leave”, then he was “commanded to sit back down” (I’m unsure as to who issued this command, but it’s irrelevant). There was no act. From everything I know, Gip isn’t the sort of guy to use elaborate posturing – if he got up to leave, I’m betting he was good and ready to be out of there. Just a few sentences before, Gip had said “We sent the salesman back to bring the offer in line with the reality.” At that point, the dealership knew what Gip’s buying criteria were. In spite of that, they did an elaborate dog-and-pony show to try to justify their higher price. The fact that Gip standing to leave wasn’t an act is reinforced by the fact that, after he sat back down and realized that the deal wasn’t going to change, he *did* stand up and leave – for good. Gip did the dealership the courtesy of bringing in management – if salespeople are screwing things up, management can (and does) frequently fix things. At the point where he’d hit the highest of the higher-ups and his criteria weren’t being met though, he left. He gave them every opportunity to salvage the sale, and they didn’t want it. This doesn’t demonstrate weakness – just like the fact that you would like a new car doesn’t necessarily mean the dealership is negotiating from a position of power. Negotiation just isn’t that simple. Either way though, the fact that Gip ultimately left without purchasing a car – and has no plans to run back begging them to sell him one – indicates the dealer didn’t have any sort of real upper hand. I think Robert has analyzed this correctly. Actually, I think the problem may be that the need was not strong on either side. My car has nothing wrong with it and I’m not desperate as I have been so many times in the past when looking for a car. And since Toyotas are in short supply due to the earthquake, they perhaps didn’t want to left with only one undersirable example of that model on their lot for test drives. They told me they might not be able to get any more for a while. In addition, saving only $30 per month and getting a smaller car with only slightly better fuel economy is not a desirable outcome for me. I needed to save $50 to $75 per month for the deal to work. And I have no way of knowing for sure how the gas mileage would have worked out. It might have been more of an advantage than I’m considering. My only mistake was in not leaving sooner. When I realized how far apart we were, I should have simple said “no thank you” and walked out, perhaps a bit more quietly than I did. The gap was too big to close. I don’t know if other dealerships in your area carry that same model Gip, but when I bought my car we called all of the surrounding dealerships that carried the model we were interested in, and told them we were planning to buy that specific model by the end of the following week. We also told them that we had called their competitors and would be purchasing from whichever dealership gave us the best offer. It really worked well. Two dealerships turned up their noses, but two played the game. In the end, we had a written offer from a dealership for the exact car we wanted for $1000 less than we were planning to spend — and a very low interest rate on financing (2.9%). We walked in, signed some papers and drove away with the car. There were no surprises. I’m not sure if this is just a difference in business culture (we were dealing with Honda), but it was a pretty painless car purchase. I have thought about sending an email with my exact specifications for trade-in and purchase as well as the monthly payment I want to several dealers to see if one would comply. It would be interesting to see if one would bite. My sympathies! I hate, hate, hate (did I mention that I hate?) car shopping/buying. The salespeople rely on loss aversion. They assume that you won’t walk away without buying because you’ve spent so much time looking and negotiating for a car that you’d really like to have. I got about 8 years out of my 1999 Camry that we bought used. It was a far superior car to my 2009 Camry — and smaller and more economical. When we bought this Camry, we didn’t realize how much bigger it was than the previous one. I usually keep a car until it falls apart and must desperately accept whatever deal is in front of me, so trying to trade so soon was a new experience for me — and worse than being desperate! The trouble you had as far as I can see it is that you wanted to reduce your outgoings and car dealers are in the business of increasing them. It’s a very difficult thing to do especially when the car you want to get rid of uses a lot more gas than the one you want. Car dealers are in the business of selling vehicles – other than approving financing or not, they don’t really care about how much you spend each month. And since their business makes money when you trade in, makes money when you buy, and makes money when you finance, they really can’t lose as long as they keep their wits about them (and customers enter the showroom to buy their vehicles). Have to disagree Robert, apologies if I haven’t read everything properly. Generally they don’t want to take on reasonably high value cars in return for selling one of a similar or lower value. It ties up money in stock and they don’t know for sure that they’ll be able to make money on it down the line. That’s why you really only can expect to get good deals trading old cars when you’re buying a new or at least a newer one. We were much closer together on the trade-in than on the Yaris. I think you’re both right, Deb and Robert. Car dealers do make money at every turn, and they must move vehicles to make money. But it’s also true that dealers can have problems you don’t know about — like an overstock of used vehicles, a tightening supply of new vehicles or other things. In this case, the trade in was a Camry, one of most popular cars in America. And we looked around their used lots and they certainly weren’t overstocked. After a minor repair or two, ours would have sold for a few thousand more than they were offering. I like the way you operate, Gip. Those guys were really out to lunch, huh? I mean, maybe there was some tact you could have taken for them to reach the figure you wanted. But that was really for them to worry about. Sounds like everyone at the dealership has forgotten the delicate art of salesmanship. Good on you for not losing sight of YOUR goal and just taking their offer out of convenience. Many a buyer’s goal would have shifted from getting the deal to owning the car once they’re in the showroom and the dealer starts talking. It seems like they did everything wrong, so I considered all of this a clear sign that this deal just wasn’t for me. Maybe I was trying to buy a car that’s smaller than I needed or something. The entire universe was against this deal, it seems. And accepting the deal that was offered to me was not really an improvement on my current situation in any way I could be certain about. We’ve stopped talking purchase price and trade in price. We just talk difference–how much we are willing to give in addition to our trade in to get the vehicle we want. We don’t care what values they are attaching to what part of the deal. That helps keep us from feeling they are undervaluing our trade in or overvaluing their vehicle. Only what we have to pay matters in the long run. That simplifies things for us. A client of mine used to tell potential RV buyers, “You have a choice. You’ll be paying (insert amount here) out of pocket no matter what, but I can write this up one of two ways. If you want to brag to your friends about how much you got for your trade-in, I’ll write it up one way. If you’d rather brag about the crazy good deal you got on the RV, I’ll write it up another.